Despite a slow start the No. 7 ranked Tucker Tigers sprinted past Mt. Zion 64-45 and into the Region 4-6A championship game at Stephenson on Friday night. Mt. Zion (10-17) led for most of the first quarter and after an early basket to start the second quarter held a 15-11 advantage when the Tigers turned up the defensive pressure. The intense defense and hustle from Tucker (23-4) led to five turnovers and turned into a 13-0 run for the Tigers to take a 24-15 lead. Jarmonte Hill started the run with an old fashioned three-pointer after being fouled on a pull-up jumper on the baseline. Myles Parker came up big in the run scoring six points, four coming off his steals. Nick Watson’s drive to the basket with 1:36 to play in the half sent the Tigers into the locker room up 29-20. Tucker went on another big 13-1 run to open the second half as Mt. Zion fell further behind at 42-21 on a nice backdoor layup by Watson who was fed an excellent pass by Barrion on the way to the basket. Leading 50-28 going into the fourth quarter, the Tigers would lead by as much as 25 (57-32) with 5:50 to play on another Parker basket. Parker would lead four Tigers in double figures with 11 points following by Braylen Seals, Jarmonte Hill and Nate Ogbu with 10 points each. West had 13 and Camp 11 to lead Mt. Zion. 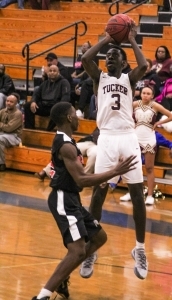 Tucker takes on Mundy’s Mill (21-6) which defeated Morrow 66-51 on Friday in the 7:00 pm boys’ championship game. Forest Park jumped out to a 32-10 lead at the half and held off the Stephenson Lady Jaguars for a 52-40 win in the first girls’ semifinal at Stephenson on Friday. Stephenson (16-11) did not quit at the half and came out to outscore No. 2 ranked Forest Park 30-20. The Lady Jaguars forced 14 turnovers in the second half and got their offense clicking. Sierra Wynn had six points and teammates Kassidy Broussard and Nikki Culbreath added five each in the fourth quarter. 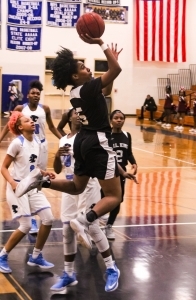 It was not enough as the Lady Jaguars fell into the three-four game tomorrow against DeKalb rival Martin Luther King Jr., which lost 52-22 to No. 1 ranked Lovejoy, at 2:30 pm at Stephenson. Lovejoy jumped out to a 30-11 halftime lead and cruised to the 52-22 victory over the Martin Luther King Jr. Lady Lions (14-13). Ashlynn Green had 12 points for the Lions. 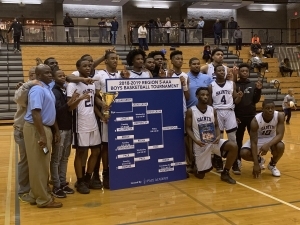 The Cedar Grove Saints rallied from a 15-point halftime deficit to beat Pace Academy 48-46 in an overtime thriller for the Region 5-3A boys’ title on Friday night. The Cedar Grove Saints rallied from a 15-point halftime deficit to knock off host Pace Academy 49-46 in overtime on Friday in the Region 5-3A boy’s title game. The Knights (20-8) roared out to a 31-16 advantage at the half only to have Cedar Grove’s Chris Carter take over inside in the second half and will his team to the win. The Saints (18-7) held Pace to just four third quarter points to pull within 35-30 with a quarter to play. Carter with two key blocks in the game helped the Saints pull into a 42-42 tie with a chance to win, but could not get a shot off and the teams headed to overtime. Cedar Grove got up 48-44 with 57 seconds to play and held on for the 48-46 win for the championship trophy. Carter finished with 14 points to go with 14 more from Kanaris Cummings and 11 from Devon Barnes. The Saints will host a first round game in the Class 3A state playoffs next weekend.